JERUSALEM (AP) — Mortified that the world may be warming up to Iran, Israeli Prime Minister Benjamin Netanyahu is taking an unpopular message to the White House and the United Nations this week: Don't be fooled by Tehran's new leadership. Netanyahu contends Iran is using conciliatory gestures as a smoke screen to conceal an unabated march toward a nuclear bomb. He will deliver those strong words of caution — and fresh intelligence — in an attempt to persuade the U.S. to maintain tough economic sanctions and not allow the Islamic republic to develop a bomb or even move closer to becoming a nuclear threshold state. With the White House cautiously optimistic about its dialogue with Iran, Monday's meeting between Netanyahu and President Barack Obama could be tense. "I will tell the truth in the face of the sweet talk and the onslaught of smiles," Netanyahu said before boarding his flight to the U.S. on Sunday. "Telling the truth today is vital for the security and peace of the world and, of course, it is vital for the security of the state of Israel." Israeli leaders watched with great dismay what they derisively call the "smiley campaign" by Iran's new president, Hassan Rouhani, last week. Rouhani delivered a conciliatory speech at the United Nations in which he repeated Iran's official position that it has no intention of building a nuclear weapon and declared his readiness for new negotiations with the West. Capping off the visit, Rouhani and Obama held a 15-minute phone call as the Iranian leader was traveling to the airport. By the end of the call, the first conversation between the nation's leaders in 34 years, Obama was suggesting that a breakthrough on the nuclear issue could portend even deeper ties between the U.S. and Iran. U.S. and European diplomats hailed a "very significant shift" in Iran's attitude and tone. For Netanyahu, such sentiments are nothing short of a nightmare. For years, he has warned that Iran is steadily marching toward development of nuclear weapons, an assessment that is widely shared by the West because of Iran's continued enrichment of uranium and its run-ins with international nuclear inspectors. The Israeli prime minister contends Rouhani's outreach is a ploy to ease international sanctions and buy time. Iran says its nuclear program is for peaceful purposes only. Israel considers a nuclear-armed Iran an unacceptable threat, given repeated Iranian assertions that the Jewish state should not exist. Israel has a long list of other grievances against Iran, citing its support for hostile Arab militant groups, its development of long-range missiles and alleged Iranian involvement in attacks on Israeli targets in Europe and Asia. On Sunday, Israel announced the arrest of a Belgian-Iranian businessman on espionage charges. Netanyahu says the new Iranian leader must be judged on his actions, not his words. In the meantime, he says sanctions and other international pressure, including the threat of military action, must be increased. He has likened Iran to North Korea, which used the guise of international negotiations to secretly develop a nuclear weapon. Netanyahu appears to enjoy widespread domestic support for his tough approach. Israel's Channel 10 TV released the results of a poll Sunday night showing that 78 percent of respondents don't believe Iran wants to resolve the nuclear problem. Fifty-nine percent said they do not think the U.S. will reach an agreement with Iran, while just 29 percent said they expect a resolution. The station did not say how many people were questioned or provide a margin of error. Zalman Shoval, a former Israeli ambassador to the U.S. who now serves as an adviser to Netanyahu, said the prime minister would present Obama with "some very hard facts" based on intelligence showing that Iranian behavior has not changed. Similarly, in his speech at the U.N., "he will make it very clear that Israel and the world at large should continue to be on guard," he said. Over the years, Israel has issued shifting assessments of how close Iran is to producing a weapon. Last year, Netanyahu presented a cartoon diagram to the U.N. showing that Iran would enter the final phase of weapons production by mid-2013. Israel has since backed off that assessment. Netanyahu's intelligence minister, Yuval Steinitz, said international pressure forced Iran to slow production. While American officials are well aware of Israel's concerns, they say there are no plans to reverse the latest diplomatic push. Two senior Obama administration officials said that the U.S. expects Israel to be skeptical about Iran's overture, and that the U.S. is similarly skeptical. Obama will try to convince Netanyahu that the U.S. won't consider lifting sanctions until Iran takes concrete actions to show it is serious about a verifiable, transparent agreement, said the officials, who spoke on condition of anonymity because they were not authorized to discuss the matter with the media. Obama will also seek to assure his Israeli counterpart that if the U.S. reaches a deal with Iran, it will ultimately advance Israel's security interests by resolving the nuclear issue without the need for military intervention. Obama's bottom line remains that Iran can't be allowed to develop a nuclear weapon, the officials said. Israel, though, wants the U.S. to establish clear "red lines" to prevent Iran from pressing forward with its nuclear program and moving toward threshold status — having the capability to build a nuclear weapon without actually possessing one. That scenario is unacceptable to Israel. Netanyahu has laid out four demands: that Iran stop enriching uranium; that its stockpiles of enriched uranium be removed from the country; that a fortified underground enrichment facility be closed; and that Iran not make plutonium, another possible path toward nuclear weapons. Eytan Gilboa, an expert on U.S.-Israel relations at Israel's Bar-Ilan University, predicted a "very difficult conversation" on Monday. The Americans "like Rouhani. They think he represents a new policy, a new approach and therefore should be given at least a chance. 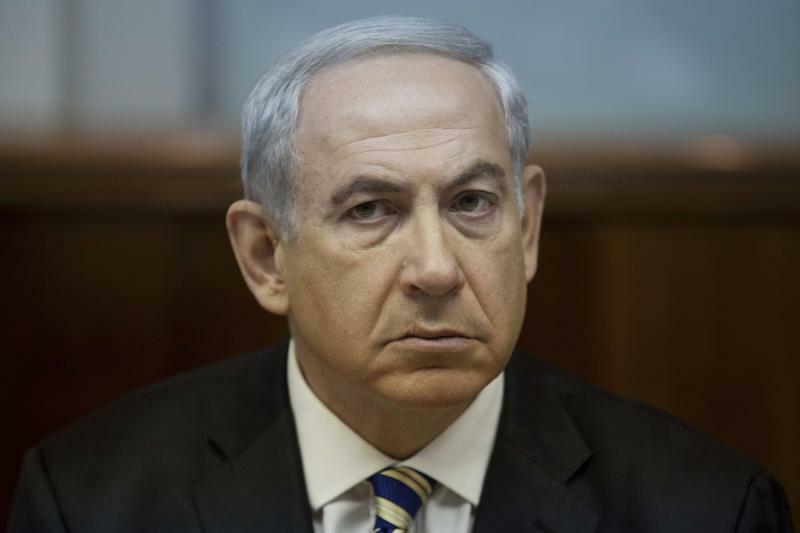 Netanyahu's strategy is to say that this whole thing is a big hoax," Gilboa said. "There are no buyers for his message." Associated Press writer Josh Lederman in Washington contributed to this report.